The America the Beautiful collection of silver coins from the United States Mint has delighted investors and collectors since its release in 2010. The massive 56-coin series debuts five new designs each year representing the 50 US states, the nation’s five overseas territories, and the federal district of Washington DC. 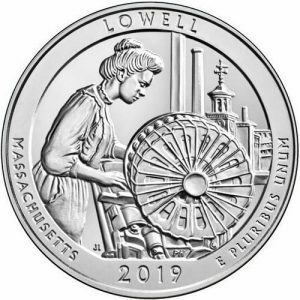 As the releases in this series near the end, the 2019 ATB Coins debut with the 2019 Lowell National Historical Park issue. This is the first issue of 2019, which is the last year with a full five designs set for release. The 2019 ATB Lowell National Historical Park Coin is one of the more unique releases in the collection in that it not only represents a specific state, but also a very particular location within that state. Lowell National Historical Park preserves several city blocks within the city of Lowell, Massachusetts. The city is situated along the Merrimack River 25 miles northwest of Boston, the city was incorporated in 1826 as a mill town. Named after Francis Cabot Lowell, a local figure, the city would become a prominent cog in the Industrial Revolution that swept the United States during the latter half of the 19th century and early 20th century. Lowell is well-known as a textile base in the northeast during the Industrial Revolution. The Merrimack River played a major role in this as the city’s industries were able to harness the power of the river. As the river moves through Lowell, it drops a total of 30 feet over just 1.2 miles. This drop produces 7,460 kilowatts of power that was harnessed over the years by waterwheels and other hydropower systems. The clock tower at Boott Mills features prominently in the design on the reverse of the 2019 Lowell National Historical Park Silver Coin. Boott Mills represented an extensive group of cotton mills built in the city in 1835. The buildings in the Boott Mills complex were constructed alongside a power canal system. The company behind the cotton mills was founded by Kirk Boott. Today, the buildings of the Boott Mills complex are the most intact in Lowell more than 180 years after their construction and are a central piece of Lowell National Historical Park. Lowell National Historical Park was established in 1978 after the previous establishment of Lowell Heritage State Park. Today, the park is operated by the National Park Service and consists of different sites throughout the city related to the region’s era of textile manufacturing. The park covers 141 acres of land and sees roughly 520,000 visitors annually. Notable features within the park beyond Boott Cotton Mill include The Francis Gate, Pawtucket Dam and Gatehouse, and the Suffolk Mill Turbine and Powerhouse. Bullion ATB coins have a shiny finish and are available in Brilliant Uncirculated condition. The coins are packaged originally in protective flips, mint tubes of 10, or Monster Boxes of 100 coins that include 10 separate tubes. Burnished ATB coins are vapor blasted after coining that results in a matte finish. These coins are produced at the Philadelphia Mint and come with a “P” mint mark on the coin’s obverse field below the engraving of “In God We Trust.” Burnished ATB coins come from the US Mint inside of a capsule and commemorative display box with a Certificate of Authenticity. The US Mint does not set mintage figures for its ATB Coins, but you will generally see much higher figures for the investment-grade bullion coins compared to the Burnished ATB coins. In either case, the coins are struck to meet demand from buyers. Beyond the primary 2019 ATB coins mentioned above, you’ll find one other option available. This option is the Colorized ATB Coin. The United States Mint does not colorize any of its coins directly at its facilities, but you can find 2019 Colorized ATB Coins available from third-party authorized dealers who add a layer of colorized lacquer to bring the US Mint’s designs to life in vivid colors. These Colorized ATB Coins are often extremely limited in availability and ship with display boxes. The colorized coins were originally bullion versions of the ATB coins that had the colorization added. You’ll find the 2019 5 oz ATB Lowell National Historical Park Silver Coins available for presale right now at JM Bullion. The coin is the first of five to feature this year. In the months to come, you’ll find the designs for American Memorial Park in Northern Mariana Islands, War in the Pacific National Historical Park in Guam, San Antonio Missions National Historical Park in Texas, and Franck Church River of No Return Wilderness Area in Idaho. If you have any questions about silver for sale, please contact JM Bullion. You can call us on the phone at 800-276-6508, chat with us live online, or simply send us an email.